There was a time when i cared two hoots for bikes; I never noticed them at all - i couldnt tell between a splendor and a yezdi. But i knew abt the bullet, yes. So there i was, blissfully ignorant and standing talkin with my friend on his porch. The highway lay right in front of his place. We were talkin, chatterin away, but both of us began to grow aware of a certain humming from the horizon; Suggested that there was something coming; Soon it grew louder - louder and louder till the hum grew into a throaty tight tone which exploded into a thunderous roar as something ripped through the horizon and blasted past us like a streak of black lightning. And disappeared in an exact reverse process. Leaving us sweating and listening to a slowly diminishing hum. My friend spoke first, and told me that "the thing" was a suzuki shogun, a latest model from suzuki. He rambled on about the RX-beater, its top speed, its ridiculously low mileage etc; While i took in those information and slowly wondered about the character-types who prefer to ride such bikes. The whole scene had a strange effect on me, though it germinated much later. But for the first time i noticed something abt a bike. 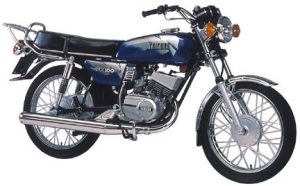 To know the Shogun better, you should know another bike from the past - The Yamaha RX100. Call it the spiritual successor of the fabulous RD350. 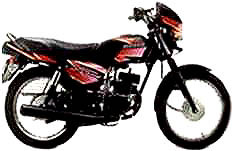 This is back in 1986; The roads were full of bullets, yezdis and cd100s - And the RX100 ruled. There was nothing as quick as the RX, nothin that could beat its awesome throttle response. Suzuki had a go with their supras; Kawasaki tried their KBs. Honda did not bother; The bullets stayed away; Well to cut a long one short, The RX smoked em all. The aim at suzuki boiled down simple - Do whatever is needed to come out with one mean machine that kicks RX asses. It is not clear what design they followed; But to be certain it was a japanese small cc machine - maybe a scooter. Whatever the base design was, the shogun was born as a 108.2cc 13.8 bhp machine, with a multiport engine and a racing silencer. The marketing campaign titled it "The Boss". Which it was; There was nothin available in the indian market which could come near the pure explosive power delivery of the shogun. The engine puts out 13.8 bhp and the bike has a max speed of around 110kmphr. Friends tell me of their shoguns touching 115, 120 etc - But a reasonable figure would be 110. Take a look at the gearing; Real real long. Drag with an RX, and unless you take off at a high rpm, you might still be in 1st gear while the RX guy is abt to move to 3rd. First gear will take you to around 40, the second to around 75 and you see 95 in third. Pretty tall gearing. One of the best parts is the silencer note and the instrumentation. Compared to the RX, it has much much better speedo, and it has a tacho too. And the silencer note yes - This depends on the person - i love the sporty throatly growl of the shogun. Anyday id listen to it rather than the metallic note from the RX - But this is totally debatable and there are people on both sides. Just a matter of preferences. Look more into the silencer and what you see is pure racing stuff - its actually an expansion chamber clothed in a straighter looking black pipe; That figures where part of the power comes from, as well as the superb exhaust note. The bike makes 13.8 bhp around 8500 rpm - way high. Yes, it does suffer a bit from a lack of low end grunt. You have to launch the bike at something above 4k rpm to use its full potential. Now coming to a more fundamental problem - The bike was designed with only one goal in mind - take the RX. With this fundamental design objective, a number of troubles have crept in. First and formost is the matter of life/durability - Nothing, nothin on the bike lasts for long - everything from the piston rings to the seat cover to the sideplates. Blame it on a higly stressed engine design where life was not at all considered an issue. And a chassis design with the only aim of low-weight. To put it briefly, whatever you do, the bike will rattle itself to pieces. Buy it, blast it, forget it. Even now in 2003, when it comes to stock class, there is nothin to beat the shogun. None of the four strokes can show a candle to it; The pulsar 180 may be close, but not enough. The modified class is a totally different story; Look at the engine design and one finds out that there is hardly anything left to do; Hardly room for a big bore kit, and the ports have been widened gross; And all the tweaks are already in place; In effect a few more bhp is the max that can be tweaked off from the shogun. Mebbe max to some 17 bhp. While the RX135s score heavily here; They are highly restricted engines, the way they are sold in india. The same base engine design put out more than 22 bhp, as being sold in countries like spain. It is not uncommon to see stock RDs being blown away by heavily modified RXes. A fully blown RX135 cut down to 80kgs is capable of a top whack of 140kmphr; And crosses the 100kmphr mark amazing quick. They can be terrific potent drag machines only the TVS factory ported shaolins can challenge.